Hidden within an ancient globe is the Shake Dimension, ruled by Queen Merelda and her Merfles. They are imprisoned by the nefarious Shake King, who steals the legendary Bottomless Coin Sack. Captain Syrup steals the globe from a museum and witnesses the plight of the Shake Dimension. She delivers the globe to Wario, who agrees to help so he can get his hands on the Bottomless Coin Sack. Wario must cross six continents, freeing the Merfles and finding the treasure. If Wario grabs something, shake the Wii remote to make him shake for extra money or items. One of the treasures Wario collects is called "Peach Sandals". The description suggest they belong to Princess Peach of the Mario series. "Sandals previously worn by a princess. They smell good. Suspiciously good." The background music for World 1-1: Stonecarving City was the inspiration for Wario's Victory theme in Super Smash Bros. Brawl. 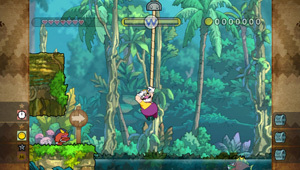 However, when Brawl was released, Wario Land: Shake It hadn't even been announced to the public. The background music for World 3-4: Glittertown is a remix of the Greenhorn Ruins music from Wario World.